Crucible debutant Craig Steadman insisted that nerves did not get to him in his first-round World Championship defeat by Ronnie O'Sullivan. The world number 81, who trailed 7-2 overnight, said the fact he knew he missed chances to be much closer to the five-times champion was the more likely reason for the 10-3 loss. "I didn't feel too nervous yesterday, I felt fine," the 32-year-old said. "But today was a bit weird coming back in. I didn't settle." 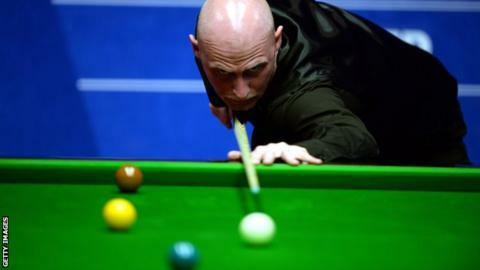 World number two O'Sullivan took full advantage of Steadman missing simple blacks and also showed flashes of his best form in the first session. "I felt a bit hard done by at 7-2," said Mancunian Steadman. "He potted a phenomenal yellow to win one frame and a fantastic red to win another one. If two of those frames had gone my way it's 5-4 and a different mindset. "I tried to enjoy it and dig in it but it wasn't there." Steadman, who turned professional in 2001, said he enjoyed the experience of being at snooker's showpiece event. "The Crucible is fantastic," he said. "I can't say I am too pleased because I got beat and, as nice as it is to be at the Crucible, it's never nice to lose. "But it's a great end to the season and hopefully it won't be the last time. I enjoyed every minute, apart from the result." Steadman, whose best ranking event performance was a run to the last 16 of the 2014 China Open, said he was so focused on the game he did not realise O'Sullivan was having shoe trouble during Tuesday's first session. The Essex player started playing in his socks because his shoes were hurting him and ended up borrowing a pair from tournament director Mike Ganley. "Honestly, I didn't notice he had taken them off, which sounds stupid because he was sat next to me," Steadman added. "Whatever he does it makes no difference to me. He could take his shoes and socks off and play in his bare feet."